There are many ways to improve as a landscape and nature photographer, and most involve learning both the art and craft of photography. The internet is overflowing with tips, techniques, how-to’s, and an ever-growing list of experts who can show you how to capture an award-winning image. Missing from this approach, however, is a sense of what is best for you as a photographer and creative individual. Continuing on the theme of cultivating creativity, I think it has tremendous value for you if any of these questions have ever crossed your mind. In fact, I think these are challenges that we all face on a regular basis as we travel along our individual creative paths. While there are many ways to cultivate creativity as a nature photographer, for example, looking at other photographs, reading instructional books, or taking a workshop, I think one of most undervalued ways is the study of painting. Photography is a language, specifically a visual language. It shares this rich visual heritage with painting and shared elements such as composition, light and shadow, or chiaroscuro, visual rhythm, form, and most importantly for me, the ability to convey emotion. While we can find a masterful use of this language amongst the great photographers of our era, there is a rich history previous to the invention of the camera that we can tap into for inspiration. In particular, the romantic painters of the 18th century defined a style based on beauty, the picturesque, and the sublime. Familiar and desirable qualities for any landscape photographer, don’t you think? Within these qualities, we find the notion of harmony, of capturing the serene, or even the mysterious side of nature. Above all, they valued the purity of nature and had a tremendous sensitivity to light, atmosphere, and mood. They became masters of their craft for a reason - they have stood the test of time, withstood criticism, and established themselves as innovators. That alone is a good reason to study their paintings and find similar ideas worth emulating. 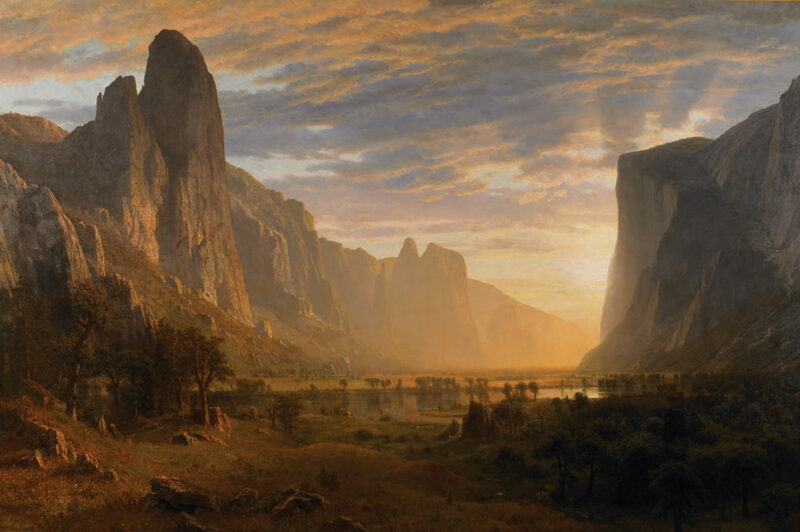 A subset of the romantic movement, the Hudson River School was founded by Thomas Cole, who came to America during the early 1820s in search of opportunity. Settling in New York City, he frequently traveled north up the Hudson Valley where he discovered unspoiled wilderness and beauty. He was so captivated by what he saw and experienced, that he began to paint these landscapes with an emphasis on realism unseen before. Because these landscapes were relatively unexplored and unknown, his paintings conveyed nature unlike any who had come before him. Soon others began to follow in his footsteps, literally and aesthetically, including his students Frederic Church, Albert Bierstadt, Asher Durand, and John Kensett. Between them, they painted the wild landscapes of the Hudson Valley, and in later years many would venture further away from the region and explore landscapes in Maine, the Rockies, the Sierra Nevada Mountains, Yosemite, and the Andes in Ecuador. They were the first to paint the American landscape and the first to feature untamed nature as the subject, not as background, which had seemed too threatening in the past. They also incorporated a sense of imagination and poeticness in their paintings that took advantage of powerful symbols in nature. Questions about our place on earth, and our relation to a greater power were explored and presented using nature as an ideal to celebrate. While their paintings fell into obscurity in later years, the 20th century brought a new appreciation of their work, and now many of their paintings are shown in national museums around the world. They are also highly sought out by collectors. Details, shapes, and leading lines were all masterfully used to convey a deep sense of realism and depth - a window into nature. Creating an immersive experience was critical to the success of their work since the general public had little exposure to this wilderness before. This meant that to hold the viewer's attention, they needed to make their compositions as harmonious and cohesive as possible. While their compositions were not necessarily simple, the viewer is drawn to areas of importance without ambiguity, and that is the key to mastering the visual language of photography. Looking Down Yosemite Valley / Albert Bierstadt - strong composition is a hallmark of the HRS painters, and here we see great leading lines from the corners, a strong diagonal from bottom left to top right, and a rhythmic pattern from left to right and back, using foreground, depth, light, and atmosphere. Light was a critical component of the HRS painters. With dramatic light they could convey the emotions the felt about the wilderness they wanted to preserve. They had the advantage of being able to create whatever light they needed in their paintings, though mastering this skill took many years of study. However, through careful use of pigments, color theory, and keen observation, they created masterpieces of beauty and emotion. Understanding how light interacts with nature, and how we respond to colors was critical to the success of their work. Unlike painters, photographers cannot create the light needed for a particular image. Instead, we must wait for nature to cooperate and provide light that inspires us in some way. Cultivating patience, perseverance, and a developed awareness of light and its many qualities is an essential skill that always pays dividends. Knowing what to look for and how to use light as a “subject” is extremely beneficial for any landscape photographer, and these painters offer us some fantastic examples. 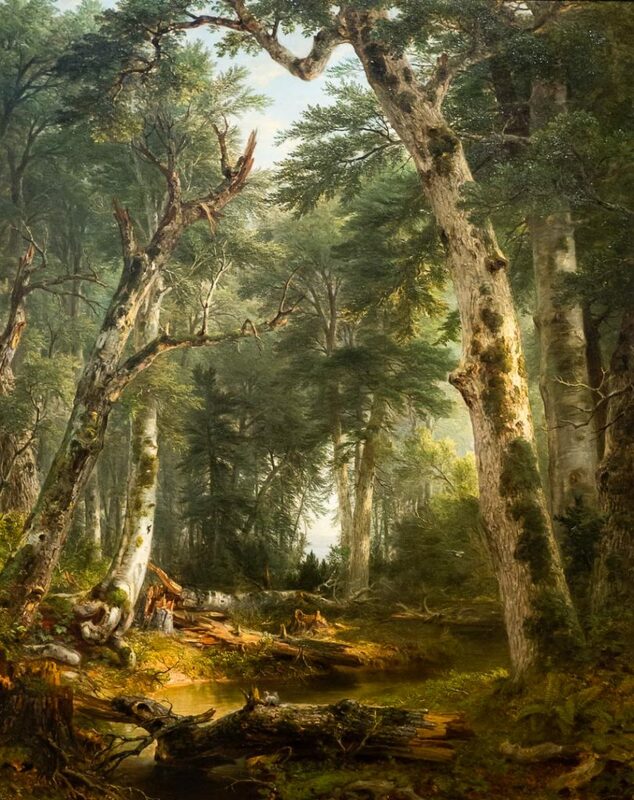 In the Wood / Asher B Durand - while lines and shapes are used masterfully to create a strong composition, it’s the light that provides the harmony between all of the potential chaos we normally encounter in a forest setting like this. It helps the viewer look past the individual trees, and experience the evocative nature of this scene. Twilight Wilderness / Frederic Church - a dramatic sky with strong leading lines helps establish the tone and feel of this image, and the shadows only help to emphasize the nature of the light and its effect on the landscape. Everything in this painting is centered around the light, from the trees pointing up to the sky, the reflections in the river, and the distant horizon, which signifies the arrival of a new dawn. The goal of any landscape photographer should be to create images that convey feelings; tranquility, tension, mystery, or perhaps a forgotten memory of a significant experience. But how do we achieve this? How do we help a viewer look past the literal and consider the meaning of an image? This is something that the HRS painters understood and used to great effect in their paintings. They used symbolism and allegory to convey their feelings about the natural world, often with connotations of the supernatural. Much of this was done through composition and the relationships between elements in their pictures. We often see large landscapes with depictions of small figures (humans or animals) to illustrate how they saw nature as grand and awesome. They used color, weather, light and shadow, and other dramatic elements in nature to suggest certain moods or create strong juxtapositions in the same picture. The viewer is encouraged to provide their own interpretation, asking more questions about the image over time. This is the essence of any great work of art. These are valuable techniques we can also use in our photography. They allow us to create images that have a little more to offer over repeated viewings and rely less on the “wow” factor we see so often today. 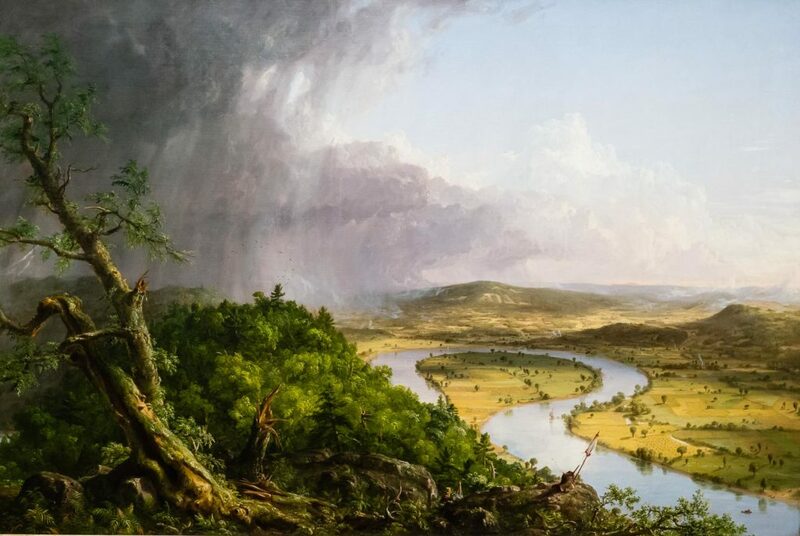 The Oxbow / Thomas Cole - one of the great symbolic paintings in American history, filled with the tension and story of the struggle between man and nature, wilderness and the tamed, and a harbinger of future struggles to come in modern environmentalism. 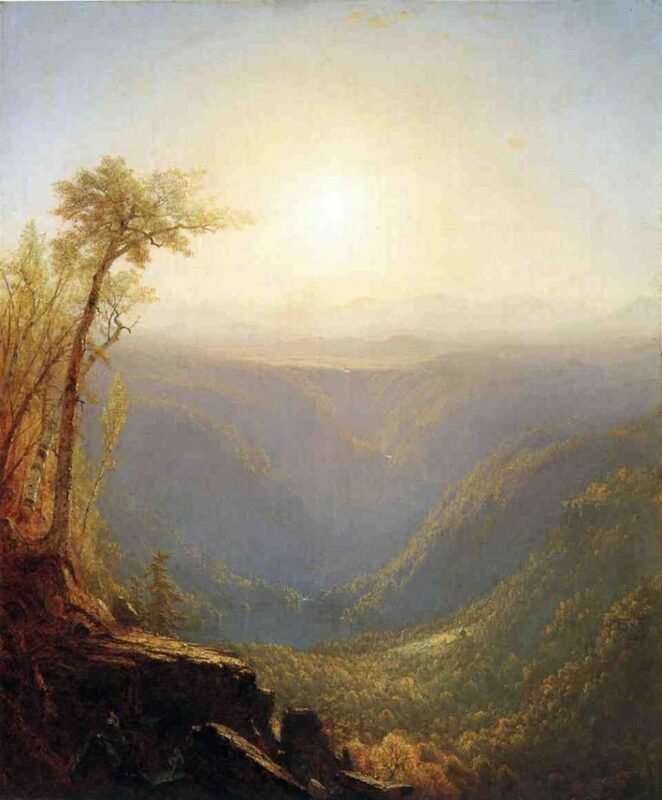 A Gorge in the Mountains / Sanford Gifford - golden sunlight carves out the center of the valley creating an almost dream-like vision of nature. Color and all of its psychological effects are used to alter our perception and feel what the painter felt, much the same as we can do with our cameras and our hearts. The following examples show how I’ve tried to apply what I’ve learned from the master painters of the past, whether photographing in the Hudson Valley or other parts of the world. Great principles can be used anywhere and can help you make compelling images regardless of the subject matter or location. There’s no excuse not to make successful images anywhere you happen to live. Don’t wait for inspiration to strike, find it through your curiosity about nature, light, and exploring your inner feelings about the subject. 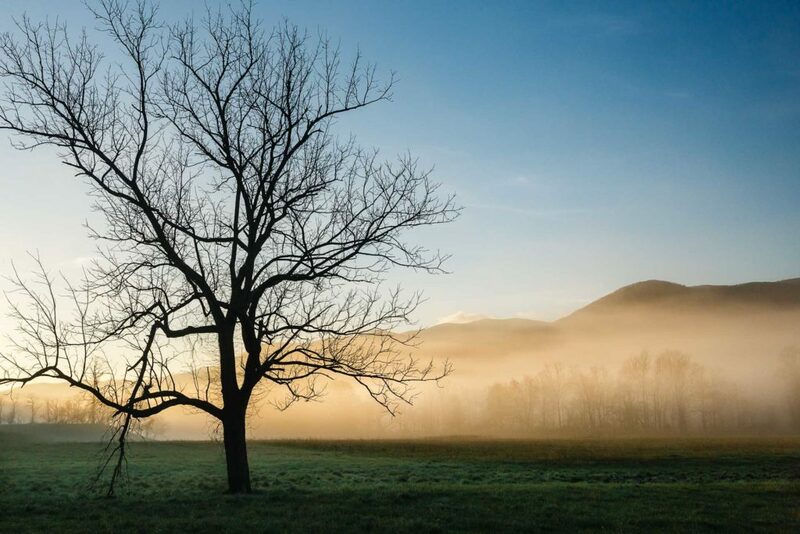 Cades Cove, Smoky Mtns - A strong and symbolic subject interacts with the background to create a sense of place and moment, and the light helps to define layers in the image for both depth and dimension. Mood and atmosphere are the main elements of this image. 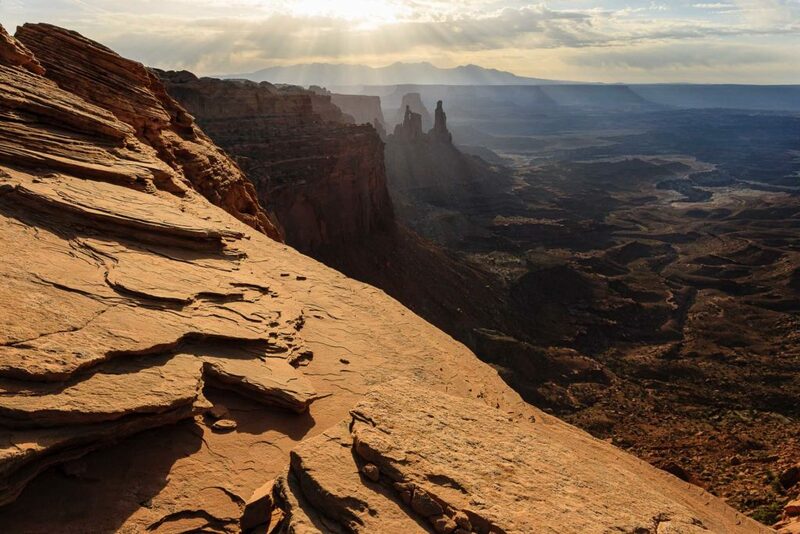 Mesa Light, Canyonlands - light is the main subject in this image, leading the viewer from the foreground to the distant mountains, and eventually, the sky where I tried to create as much of a climax to the overall feel and drama, much like a symphony. Backlighting helps to emphasize the depth of the shadows and bring attention to the texture and detail, so important to the place and sense of scale. 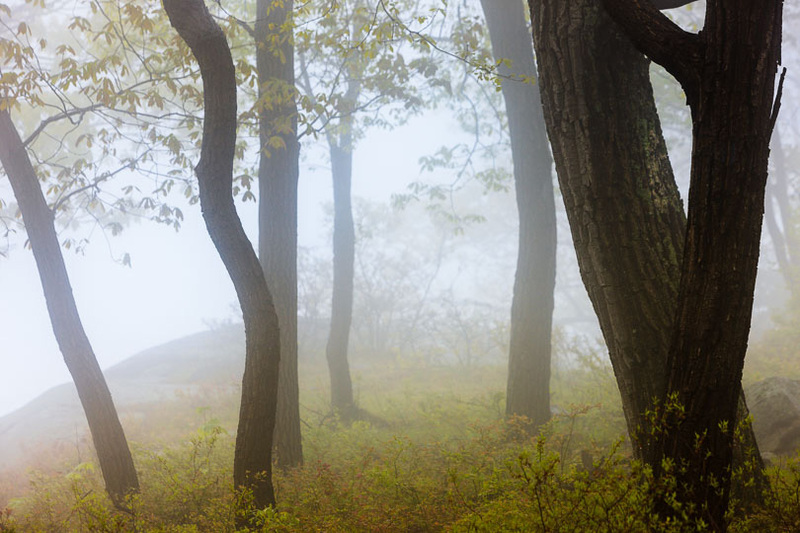 Tree Songs, Hudson Valley - once again light creates a strong sense of mood and atmosphere, helping to convey what I felt in this place at that particular moment. Intimacy, quietness, and even a sense of the sublime were the common themes in my mind, and using lines and subtle but interesting shapes is key to the composition. 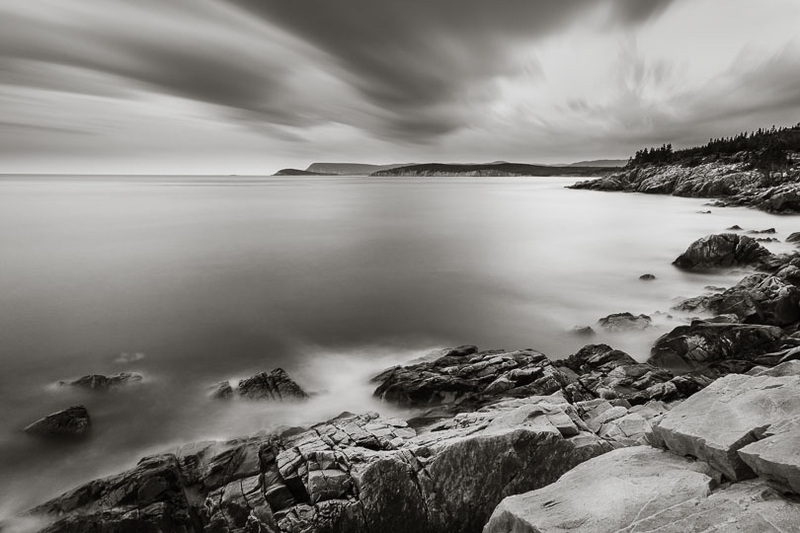 Cape Breton Is, Nova Scotia - using simple but strong lines, curves and shapes help the eye travel easily from foreground to background in a slow but smooth rhythm. The 2 minute exposure helps to create smooth tones in the water, and an ethereal feeling in the sky, which I hope lifts the viewer from the literal to the emotional. 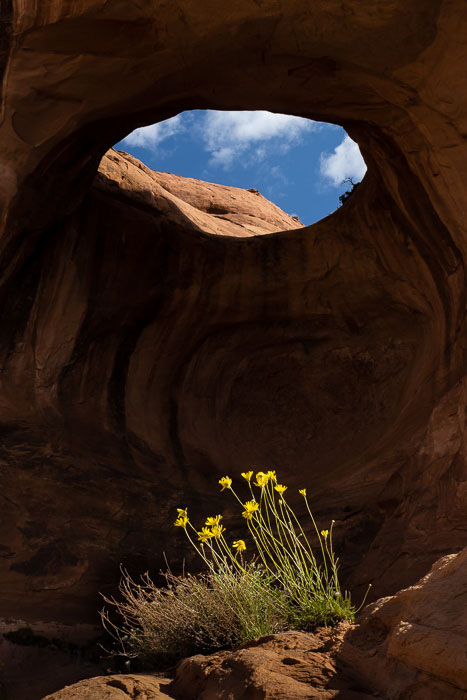 Flowers at Bowtie, UT - I was most attracted by the relationship between the sky and the flowers, and the story it tells. Light is the main subject, illuminating the main elements. I darkened the background in Lightroom to emphasize this (HDR would remove the mystery) and used a vertical perspective to bring a sense of energy to the composition. I hope that these examples inspire you to think more broadly about your landscape photography and explore all of the wonderful opportunities we have outside of our doors each day. The more we learn about all art forms, the more we have to draw from in our minds when we’re struggling with making our own art. It has certainly challenged me to see the familiar with a little more curiosity. Evocative light, a dramatic moment, or simply a passion for a landscape means a potentially great image is never far away. It also means more meaningful experiences are sure to follow, technology-drivengy driven world, that’s the only thing that will make a difference. While I have shown images from near and far, it is this possibility that keeps me motivated day after day, and year after year to venture out into my backyard of the Hudson Valley as often as I can.